Simerics CFD for SOLIDWORKS is a multi-purpose Computational Fluid Dynamics (CFD) and multi-physics simulation tool that provides fast and accurate solutions for predicting the real-world performance of a variety of products. Through the use of modern-day, innovative architecture and algorithms, Simerics is able to simulate complex fluid systems with unparalleled speed and accuracy. Simerics utilizes the fundamental laws of conservation of mass, heat, species, and momentum to provide accurate and physically meaningful simulations for the purpose of product validation, design optimization, problem diagnosis and research. The results have excellent correlation with physical test data for a wide range of systems. Flow, Turbulence, Conjugate Heat Transfer, Radiation, Aeration, Cavitation, Multi-component Mixing, Free Surface, Particles, 1-DOF dynamics. Excellent correlation with test data for a wide range of applications. Less than an hour from CAD to Simulation, and less than 15 minutes for steady-state results. Accurately model detailed features with no simplification of the geometry required. Simerics provides state-of-the-art numerical capabilities and ease-of-use at a cost equal to or lower than codes with less capability. Fast and automatic meshing. Meshes can be adjusted manually if desired. Fast run-time, fast convergence, and rapid simulation results. Ease-of-Use provides a solution that both Design Engineers and Analysts can leverage. Lower cost of ownership. Choice of perpetual and subscription based licensing. Application specific templates that provide for significantly shorter set-up times. Much less time required to prepare the model for analysis. Ability to very quickly extract the fluid volume. Automatic sealing “leaks” in the geometry prior to running analyses. Listed below are just a few various applications where Simerics has been used. If you would like to know more or have any questions, please contact us. Simerics® MP is a collection of core 3-D CFD capabilities and physical modules that enables accurate virtual testing for multi-purpose (MP) applications involving fluids, heat transfer and fluid-structure interaction. Conjugate Heat Transfer: Simerics MP can predict conjugate heat transfer (CHT) through different fluids and solids materials in contact. 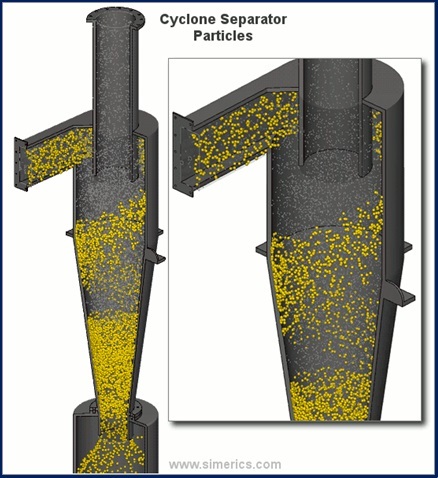 The Simerics Particle Module enables the simulation of particles. It tracks individual particles using a Lagrangian Reference Frame. This is a partial listing of examples for applications of Simerics with Pumps. To get a fully comprehensive list of applications and more information, please contact us. Simerics-PD predicts flowrate, output power, output torque, efficiency, motor speed, loads, leakage flow, cavitation and aeration, and pressure ripple for orbital gerotor motors. PumpLinx predicts the head rise, pump power, pump efficiency, Net Positive Suction Head (NPSH), cavitation damage, parasitic losses, pump aeration, bubble formation, pressure ripples, pump leakage, axial loads and side loads in centrifugal pumps. PumpLinx is used to predict the flow rate, power, efficiency, cavitation damage, parasitic losses, aeration, bubble formation, pressure ripples, leakage, axial loads and side loads in external gear pumps and motors. This is a partial listing of examples for applications of Simerics with Valves. To get a fully comprehensive list of applications and more information, please contact us. Simerics-MP+ is used to predict the cracking pressure, flow-rates, valve dynamics, valve loss coefficient, valve loads and cavitation damage in valves. Speed enables full transient simulations. This is a partial listing of examples for applications of Simerics with Compressors. To get a fully comprehensive list of applications and more information, please contact us. Simerics-MP+ can predict the performance of Scroll Compressors and has been validated by comparison with experimental data. The advantage of using Simerics-MP+ for Scroll Compressors is the accuracy of the solution, the ease and ability to create a mesh optimized for the compressor geometry, the ability to account for tight clearances, and the speed of the simulation which has been reported to be 10-30 times faster that the competition. Simerics-MP+ is now being used in conjunction with the grid generation software SCORG© from the City University of London (Kovacevic A.et. al., 2007, Screw compressors – Three dimensional computational fluid dynamics and solid fluid interaction, ISBN 3-540-36302-5, , 2007) to model the performance of Twin Screw Compressors. Simerics-MP+ can be used to predict the performance of Compressors as well as Pumps and has been validated by comparison with experimental data. The advantage of using Simerics-MP+ for Compressors is the ease and ability of the general mesher to create a mesh, even for a complex geometry, and the speed of the simulation which has been reported to be 10-30 times faster that the competition. This is a partial listing of examples for applications of Simerics with Turbines. To get a fully comprehensive list of applications and more information, please contact us. Simerics-MP+ can be used to predict the performance of water turbines, propellers and waterjets, including the effects of aeration and cavitation. This is a partial listing of examples for applications of Simerics with Motors. To get a fully comprehensive list of applications and more information, please contact us. Simerics-MP+ is used to predict the head rise, flow rate, pump/motor power, pump/motor efficiency, cavitation damage, parasitic losses, pump/motor aeration, bubble formation, pressure ripples, pump/motor leakage, axial loads and side loads in bent axis piston pumps and motors. This is a partial listing of examples for applications of Simerics with Combined Systems. To get a fully comprehensive list of applications and more information, please contact us.